How do I do it? Open the avocado and remove the pit from the center. You can eat the fruit of the avocado — it’s yummy and is full of nutrients! Carefully push three toothpicks into the thickest width of avocado, you want to push the toothpicks into the pit about a 1/2″ deep. (It’s okay if you push them in deeper or even a little less) The toothpicks will help suspend the avocado pit in water and keep the top part of the pit in fresh air and the fat base of the pit under the surface of the water. Suspend the pit over a glass filled with water. The toothpicks will rest on the rim of the glass and hold the pit in place so it doesn’t sink to the bottom. Always check the water level in the glass and see that the water is covering the fat base of the pit by about an inch depth. If the water is below that level you’ll need to add some more. When the stem grows to about five or six inches, pinch out the top set of leaves. In another two or three weeks new leaves will sprout and there will be more roots. It’s now time to plant the young avocado tree. Place enriched potting soil in a large flowerpot (maybe 8″ to 10″ across). Fill the soil to about an inch from the top of the pot. Make a small depression in the center of the soil and place the pit, root-side down into the depression. Don’t put it too deep — you want to have the upper half of the pit above the soil line. Add some more soil around the pit to fill in any air holes by the roots and then firm it into the soil by gently pushing the soil around the base of the pit. The tree’s stem and leaves should be straight and pointing up. How do I care for my avocado tree? Keep your tree in a sunny window, the more sun it gets the bigger it will grow. Remember to give it frequent light waterings but don’t let the soil get muddy. If the leaves turn yellow, it means that the plant is getting too much water. Let the tree’s soil dry out for a couple of days, then return to light waterings. Can my avocado tree ever go outside? Yes, it can go outside in the summer. If your winters are cold ~ below 45 degrees (F) or 7 degrees (C) ~ you must bring your tree inside for the winter. Otherwise, if your winters are cool and mild, the tree may stay outdoors year round. Will my tree ever grow fruit? Sometimes they will begin setting fruit after they are three or four years old. 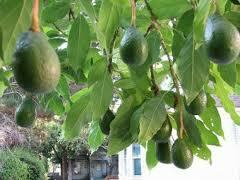 It helps to have several avocado trees growing together to aid with pollination. How tall will my avocado tree grow? 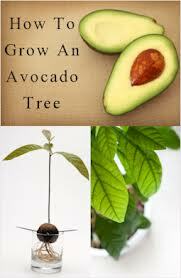 An avocado tree is a medium to large tall tree. It can grow between 20 and 40 feet tall. With pruning, it can be kept at a much shorter height.